September or October 2016 is the anticipated opening date of the Grower Guys in a remodelled building at 8500 Lake City Way NE. 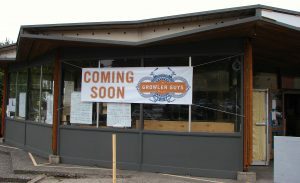 A “coming soon” banner is up, indicating that the remodelling work will soon be finished at Growler Guys, 8500 Lake City Way NE (former Ying’s Drive-In.) Business owner Kelly Dole has not yet set an exact date of opening. Read here about the history of road house restaurants on Lake City Way NE.